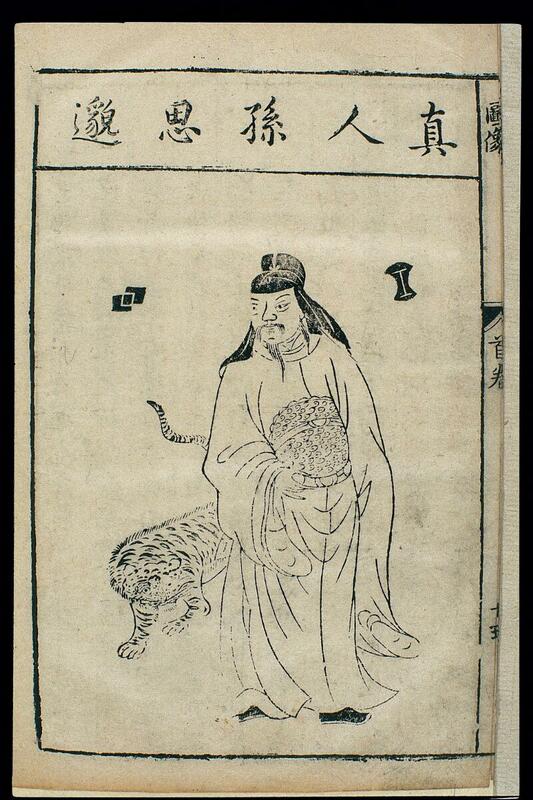 One of a series of woodcuts of illustrious physicians and legendary founders of Chinese medicine from an edition of Bencao mengquan (Introduction to the Pharmacopoeia), engraved in the Wanli reign period of the Ming dynasty (1573-1620) -- Volume preface, 'Lidai mingyi hua xingshi' (Portraits and names of famous doctors through history). The images are attributed to a Tang (618-907) creator, Gan Bozong. The account in 'Portraits and Names of Famous Doctors through History' states: Sun Simiao was a native of Huayuan, Jingzhao. He was a gifted child, with a retentive memory, and as an adult he was able to discourse on the various schools of philosophy derived from Laozi and Zhuangzi. At the end of the Northern and Southern Dynasties period (420-589), he retreated to Taibai Mountain, to study Daoism and practice breathing exercises and self-cultivation. Though Emperor Wen of the Sui (581-618) offered him the position of Guozi boshi (Erudite of the National University), and Emperor Gaozong subsequently invited him to the Tang court, he steadfastedly refused public office. He was skilled in astronomical divination and had made a profound study of medicine and drugs. His character was philanthropic and charitable, and he cared for all living things. So the story goes, he once witnessed a man in the act of killing a grass snake. He took off his outer garment, which he offered in exchange for the snake's life, then he dressed the creature's wounds and set it free.